Happy Monday friends! 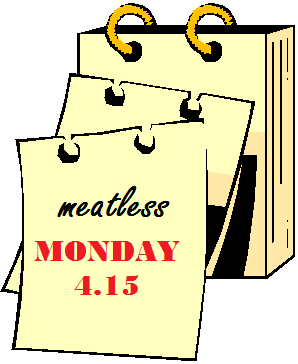 Being the foodie that I am, I can’t even think of the word Monday without thinking automatically of the the word ‘meatless.’ We try to do ‘Meatless Monday’ at least one day a week (not always on Monday, but hey, at least we are doing it!) and I am always looking for new ‘meatless’ meal ideas, recipes, tips and inspiration. Because I am always on the hunt for fresh ideas (recipes my guy will want to eat too) that I am planning to do a lengthy vegetarian recipe round up later this week. But today I am sharing some tips (in an article I wrote awhile back for meal planning/recipe site, Food on the Table) to help get you and your family started eating ‘meatless’ at least one day a week. Be sure the check out a (small) round up of meatless meals at the bottom of this post (and then check back later this week for more ideas). Also, if you eat meat free regularly or even just once a week, please share any tips or any of your favorite recipes in the comments below! Designed to raise environmental and health awareness, the “Meatless Monday” campaign has been gaining popularity over the years. The idea is simple, one day a week, eliminate meat from your diet and eat more fresh fruits and veggies. This simple change of eliminating meats one day a week will not only save you money on your weekly grocery bill, but will reduce the risk of heart disease, help with weight loss, and over all promote healthy eating and lifestyles. Getting your family to go meatless one day a week may seem like a challenge at first, however with perseverance and these six tips, Meatless Monday can be a success. Preparing new meals and learning new cooking and eating habits may take some time to get accustom to; thus, choose a convenient day of the week for your family to eat meat free. Use this day to not only prepare meatless meals but as a day to prepare fruits and vegetables for meals and snacking throughout the week. Learning new cooking techniques may make those veggies more appealing to kids, and even adults. Try eating vegetables raw, steamed, sautéed, roasted and grilled. No need to fret about the protein! There are many meatless protein options available; try quinoa, beans, lentils, whole grains, seitan, tempeh, tofu, and veggie burgers/crumbles. Be creative. Take family favorite recipes and change them to be a meatless option. Love chicken parmesan? Try eggplant parmesan. Other options are black bean burgers, meatless soups and chilies, salads, enchiladas filled with veggies or rice and beans, and even a vegetable stir-fry. Do research. Libraries, bookstores, local groceries, farmers markets, recipe websites and blogs are all valuable resources to find additional vegetarian meal ideas, cookbooks and tips. Take advantage of local chefs, restaurants and grocery stores that may offer vegetarian cooking classes. Find support in friends and family by encouraging them to also eat meatless meals one day a week. Host a vegetarian recipe exchange or neighborhood vegetarian potluck block party to share meatless meal planning tips, tricks, and recipes. To get your Meatless Monday started, try one of these hearty vegetarian recipes! Thank you for lots of Meatless Monday -inspiration!